Did you know writing is the most difficult section to score than any other part of the IELTS test? Well, according to official data, the worldwide average writing band score is 5.5 compare to 6.0 in other sections. Not only that, this average is as low as 4.5 in some countries of the Middle East as Saudi Arabia, Qatar and UAE. Saying that, the poor performance in writing can seriously hurt a person`s overall IELTS band score. Perhaps that`s why increasing number of candidates wish they could change their probable failure in writing section. For hundred of years, all the ways from academic to professional fields, the capacity of writing well carries a great significance. 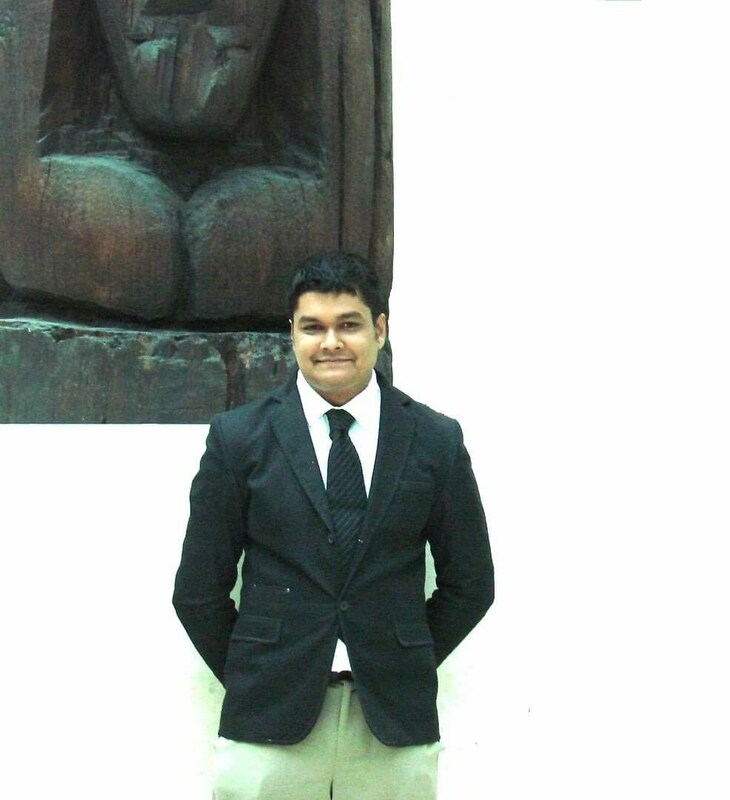 It`s a reliable indication of a person`s level of education and has enormous impact on his academic results and on maintaining relation with peers in career. This means, an excellent writing capacity can improve both of your academic and professional life. More than 1,000 deaths in plane crashes have been due to low English proficiency of pilots since English has been the language of air travel in 1950's. Here is another one: Not a single non-English speaking country top professional qualifies English proficiency as "advanced” that is equivalent to IELTS band 7 to 9 level. Therefore, it is needless to say that most people of the world do not have the skills to score even as low as band 7 in the IELTS writing test. The only option remains then is to elevate current writing standards or skills! When we talk about the need for linguistic proficiency, English suppress all other language in many ways. Companies around the world are using English as a common language of communication (lingua franca). This is why your higher English proficiency makes them more attracted to you…more eager to employ you..more eager to do business with you. Plus, it makes you more innovative and gives stronger financial gain. So, if higher English proficiency is so important, why don`t people have it… and…why they don`t bother to get better? They don`t know the way to do this! There are many reasons people don`t have a chance to enhance their English skills. For example, some people do not find an intensive English-language training centers that are 100% committed to mastering the language. Others mislead by ineffective teaching resources. Some are lousy and some people are too busy to concentrate on this. And, almost everyone wished their English were better! The same is true for IELTS candidates… almost everyone wish to score better! But, for most of them, this dream never comes to reality. That`s a band news. The good news is, every single one of them can show improvement by proper guidance that can take just few minutes of their daily life. Of course, not every training scheme can do this. When it comes to build IELTS writing skills, the vast majority of teaching manuals or tutoring programs are specialize in attaining an average writing band score up-to 6.5. There is at least one such treasured source exist today specialized on giving such gifted insights. We`ll talk about this special treasure a little later. But, let`s talk about what most people think about achieving a very good writing band score…which is..do they answer the task or not. In other words, they are concerned about how far their answer reflects the question …or..more accurately, how far they can answer every key areas of the task. But, let me tell you- that`s an incomplete view. Do you know how IELTS examiners grade a student`s writing? They do it on response, vocabulary, grammar and organization. The way she grades an answer with a very good or average score..is..she holds a standard manual supplied by the official IELTS authority and sees whether the answer closely matches those standards or not. I agree that the official diction to describe bands are not exactly same as above. I make small adjustments here for your better understanding. Now listen: You need to remember IELTS Task 2 carries more weight (twice) in marking than Task 1. This means if you score a band 8 in task 1 and a band 6 in task 2 your total writing score will be only 6.5 (8+6+6=20/3=6.66). Now, just the opposite math- a band 8 in task-2 and a band 6 in task-1. In that case. your total score will be 7(8+8+6=22/3=7). When you answer task -2 very well, your chances to score 7 or more goes up even with a moderate task-1 response. 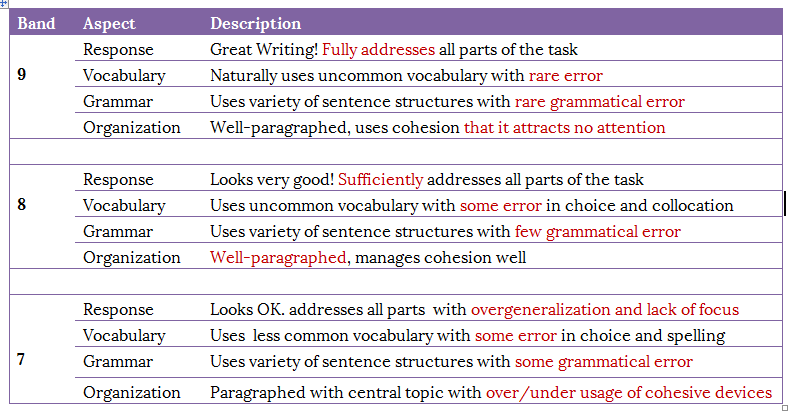 That`s exactly why you just read in the above table- are top band descriptors for writing task-2. Now, you may be asking yourself: “What about task-1?”. The answer is easy: You don`t need to worry about task-1 to get a high band score. Not any more. An average answer will do so (and you know why). Now, there are some interesting facts (described in the table) that makes a band 9 answer different from a band 8 or a band 8 from a band 7 one. You see, writing task 2 is assessed using 4 key aspects. Description of these 4 aspects helps determine the proficiency level of your writing. You know a band 7 IELTS writing can easily be uplifted to a band 8 or 9 with just few adjustments. You need to address all parts of the task averagely or sufficiently to get band 7/8. Furthermore, to jump from band 7 to 8, you need to avoid overgeneralization by giving a specific & focused answer-adorn it with relevant, extended and supported ideas. But, what if, you`re one of those people who want nothing but the best? What if you are savvy enough to say, “A want a band 9”? It`s not impossible. You know why? Because, as far the task response concern, you just need to shift your focus from sufficient to fully cover all part of the task. Leave nothing-answer every question asked in task with extended, well-supported ideas. It`s a baby step for you but a giant step to knock the door of band 9. A very good band 9 answer would have less common task specific words or phrases with rare spelling error. Less common words looks great and it works great to get 9/8/7. While in a band 7 or 8 answer, the use of less common words and phrases sometimes would not fit the context of the given task and can have some spelling errors. Whether it is a band 7, 8 or 9 answer, all would pay the same price - when you consider grammar. In any cases, a range of sentence structure from simple to complex to compound or blends is obligatory. However, in a band 7 answer these sentences would have some grammatical error, few in band 8 and almost no error in a band 9 response. Paragraphing is an essential feature of band 7/8/9 writing. That means, you could have an introduction, conclusion and several body paragraphs in your essay. Or, you could omit the starting or closing paragraph to get below band 7 (I wonder who would do so?). Now, come to the element like “cohesion”. Cohesion in any text can be maintained by using sophisticated linking words and phrases, grammatical or lexical devices and organizational patterns. These are the 3 ways to achieve cohesion in your IELTS text. A band 7 answer generally use any single device to achieve cohesion. While in case of band 8, the candidate may include many types of cohesive devices. And a band 9 response uses these devices so naturally that theirapplication attracts no attention. Now let`s take a breather for a good reason……..
What I just write above might sounds like jargon and puff speak to you. Anybody with a brain can do that. Anyone can look upon a task and see what the question has asked to write about and then just start writing. But, developing ideas relatable to the required task points and make it sensible is often the reason why so many candidates fail to score high as 7+. Using less common vocabulary is not a rocket science, if you know where to use them (and most importantly where to find them). You need to know how to write complex or compound sentence or a blend of both with zero grammatical error. And you now what? No matter how long or complex the sentences would be, making them grammatically correct require a handful of rules. Present a well paragraphed answer with connected ideas so that it require no effort from the examiner to determine the meaning. Of course, I am talking about coherence and cohesion your text. By these terms most people can only relate to linking words, linking words and linking words. But linking words are not the only tools to create cohesion. There are many other ways to do so. What about using referencing or rhetorical questions? You never heard of these terms, do you? But, you need to use every possible ways of achieving connection at the between sentence level and beyond to score as high as band 8 or 9. And these are not isolated secrets! It's neatly printed on the official IELTS site for all candidates, so people can use them to skyrocket their score almost overnight. If that`s the case, it`s really unfair why you are not deserving a better writing score. Of course, I am telling about anything more than a band 7. You know why people think targeting a band 8 or 9 is just insane? It is because, for some reason, they simply feel they don`t “deserve” to score that good. Another reason people do not set about to get a “band 8 or 9” is for having low self-esteem. They deserve that low for the lack of proper information or guidance that clouded them in disbelief and confusion. May be you`re one of those people who are afraid of “high bands”. May be that used to be true. Now you can aim high for a band 7 or 9 and everything in between with stripped-down, accurate, hard-hitting, highly concentrated packets of mega valuable tricks- that you can consume in as little as 1 hour or less. “An amazing easy to digest report filled with “full load’ of techniques is on the way to knock your door to ensure your awful IELTS writing band score”. Now, let`s talk about how this booklet will give you valuable techniques to bombast your writing band score. Address all key points of the task and develop them appropriately. Present complex ideas in longer and more diverse (sentence) structural and grammatical forms. Using more sophisticated cohesive devices and organizational patterns to support views subtly, fluently and to present a coherent whole text. Use less common vocabulary items to express ideas more succinctly and precisely. These are four “mandatory” components of a response that every high scoring candidate must have at their fingertips. And that is why I am writing to you about the special report. For that is the whole purpose of this report: to put together all these components in a comprehensive tutorial that practically drag your IELTS writing towards a top band score. You`ll be able to set down your ideas in written words and develop them in clear, compelling English. You`ll be able to lead your thoughts with verbal and grammatical dynamics. All of that can give you a tremendous band boost. Even if you only implement ONE technique of what you`re going to learn..that one technique leads you to considerably increase your band score. Plus..
It`ll be simple and easy to apply all these techniques. You see, the report I am telling about is unique in all way. It's filled with stuff that nobody else can share with you because nobody else is doing it. It combines all the important techniques on the way to top writing band score with in-depth tutorials. Every components of a band 7/8/9 is covered. You`ll see formulas for breakthrough IELTS writing. All you do is apply the formula in your IELTS writing test and wait for a winning result. Beside, the entire report takes only an hour or less to read. But, don`t fell skeptic about the size- the proper use of techniques according to the simple instructions, will save your years of misery in quest to achieve a very good score. Then, of course, there`s the expense. There`s no getting around it, any intensive "high value" offering guide is not cheap. In fact, if you get all practical information that can solve an utmost problem of your life....that you think enormously valuable for you to know... help you to get that “sparkling result” you`ve always wanted , then it`s worthy to spend some bucks. The truth is, it`ll be more expensive not to have those information than the little money spend on it. It's as simple as that. Conversely, this particular guide I am talking about is probably going to cost you less that you would have to pay for any up-to-the-minute guide book to super-charge your ability to hit right at the zenith of IELTS score! If you to harness the power of this book, click the button below to do it now. One more thing: If you are serious about making a big score, you should probably buy today! Because, you don`t want to miss the exiting discount coming with the first release.. ( with only limited time offer).